I celebrated the start of February with a heart healthy pizza and will wrap up the month the same way. Navy beans and kidney beans are an excellent source of fiber, protein, and calcium. Both beans help regulate blood sugar levels, which was of particular interest to me for this pizza because one of my guests struggles with diabetes. After pre-baking my homemade dough (50% spelt, 50% white flour), I spread on a little of my homemade pizza sauce and sprinkled on cheddar cheese. I topped the pizza with kidney beans, Navy beans, cilantro (another food that regulates blood sugar), green peppers, and onion. I’ve found that cilantro can overpower other flavors, but on this pizza it complimented the flavors very well. My Navy and kidney bean pizza was a hit and I am certain I’ll experiment with beans on pizza again. This entry was posted in beans, cheddar cheese, cheese, herbs, Onion, peppers, pizza, pizza sauce, sauce, vegetarian, veggie. Bookmark the permalink. You had me until… cilantro. I’m definitely not a fan of cilantro. Parsley yes, cilantro no. I usually don’t like cilantro either but it had a mild flavor when combined with the other toppings, I loved it on this pizza! beans on pizza! What an interesting idea! I’m going to have to try this recipe! Thanks! 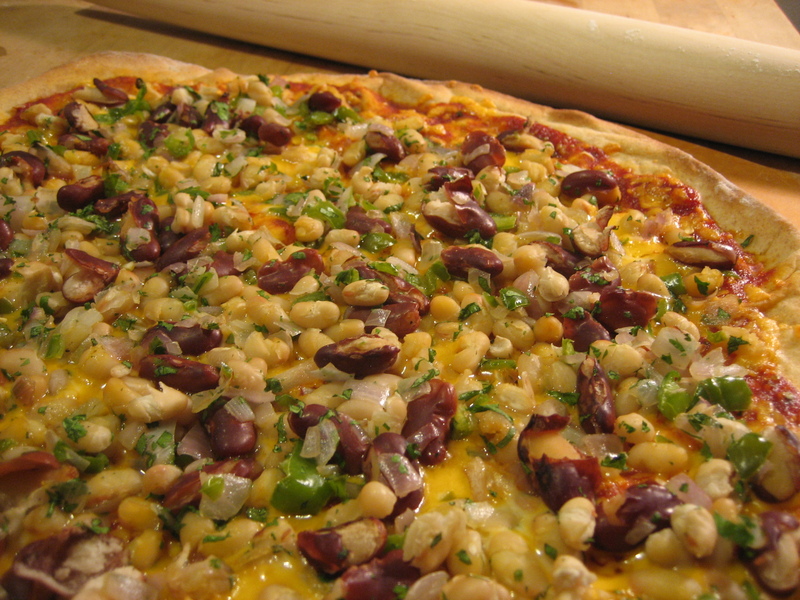 I have tried beans on pizza several times and most of the time it has been great! I’m not a cilantro fan either, but substituting parsley always seems to do the trick. 🙂 Interesting pizza combination! Thanks! I usually don’t like cilantro but the flavor was not overpowering and blended really well with the other toppings on the pizza. That’s great. So cilantro used in moderation is good. I might have to take your advice and let go of my prior cilantro disasters. LOL! I usually use parsley in place of cilantro too.